Many commercial buildings incorporate sections of curtain or ribbon walling and H Jarvis is fully skilled in handling this fenestration requirement. Whether a refurbishment project or a feature of a new building, the design and installation teams with the technical backing of Eurocell plc have the expertise to ensure the curtain walling matches the aesthetics of the rest of the building. Facilitating the construction of a wide range of styles and sizes, the curtain walling system is made up of a series of aluminium beams of different dimensions, designed to take bending and sheer loads. 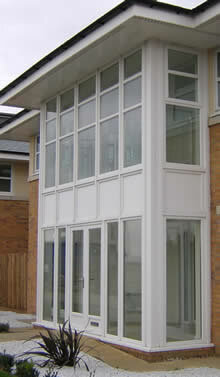 Fitted into these grid combinations are windows in most styles. The grid system has its own drainage, thermal break, expansion/contraction elements constructed into the system. 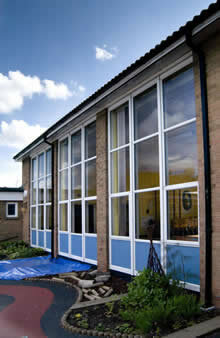 Curtain walling is designed and fitted to offer total structural integrity and safety. On larger scale projects or where the installation is unusually exposed, H Jarvis ensures that a structural engineer checks the wind loading and strength loadings.